The last two problems of the week established that π is less than 4 and greater than 3, and less than 4 and greater than 2 by looking at the ratios of the perimeter/width of a square and the circumference/diameter of a circle, and the area and radius of a circle. We invite you now to use these three figures to reason why pi must be approximately 3.14. Imagine that you had never been told that π ≈ 3.14. 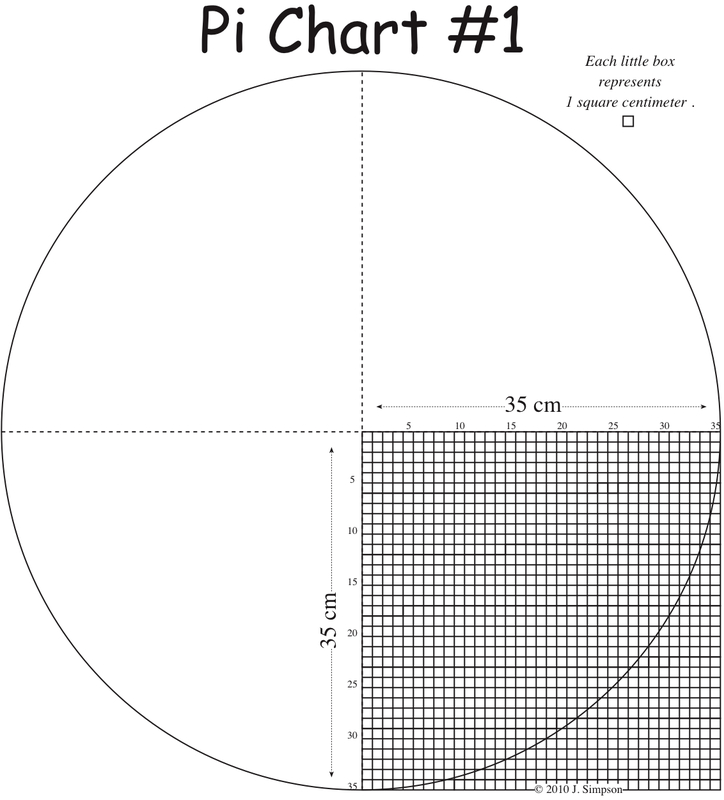 Use Pi Charts 1, 2, & 3 to prove that the value of π ≈ 3.14. Each little box represents 1 square centimeter. The solution will be posted next week. 1. 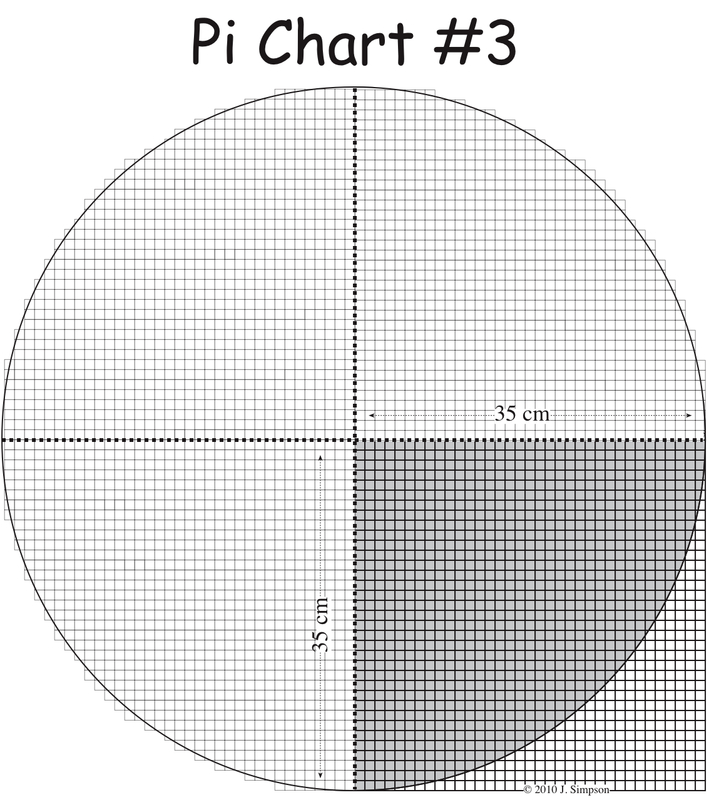 What is the area of the shaded part of Figure 1? What is the area of the entire figure? What is the ratio of the whole area to the shaded area? 2. How many squares are there in Figure 2? 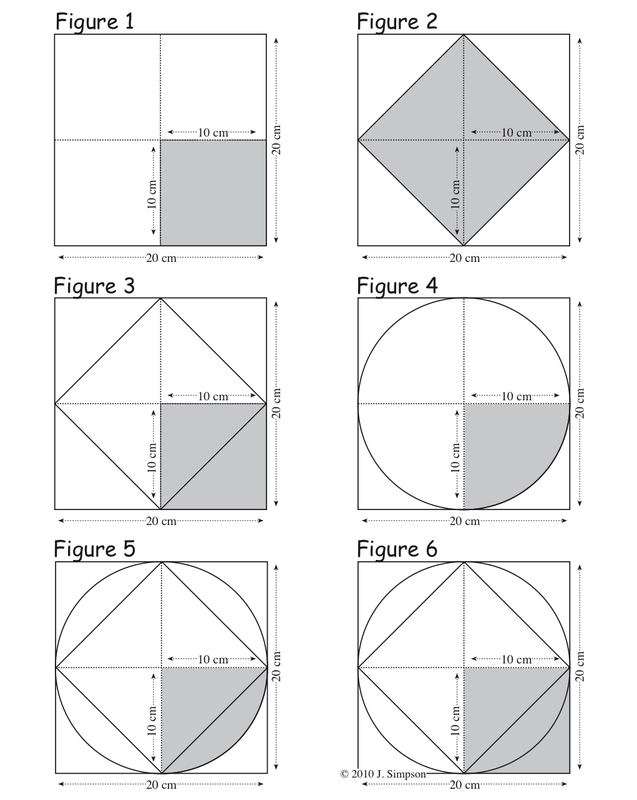 What is the area of Figure 2 (the whole thing)? What is the area of one of the shaded triangles? What is the area of the shaded square (the square-within-a-square)? What is the ratio of the whole area to the shaded area? 3. In Figure 3, what is the area of the square-within-a-square (see Figure 2)? What is the area of the small shaded square in the corner? What is the ratio of the area of the square-within-a-square to the area of the small shaded square in the corner? 4. What fraction of the circle in Figure 4 is shaded? What is the ratio of the area of the entire circle to the area of the shaded part of the circle? 5. In Figure 5, what is the area of the shaded triangle? What is the area of the 10 cm x 10 cm square in the lower right corner? Is the area of the shaded part of the circle more or less than the area of the shaded triangle? Is the area of the shaded part of the circle more or less than the area of the square in the lower right corner? 6. 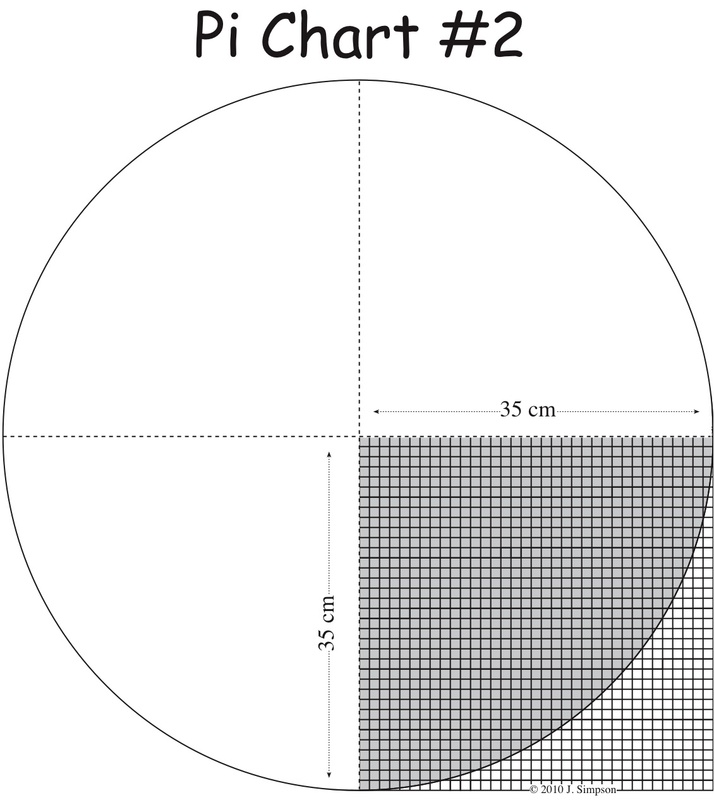 In Figure 6, which is greater: the area of the 20 cm x 20 cm square, or the area of the circle that is drawn (inscribed) within the square? Which is greater: the area of the circle, or the area of the square-within-a square (see the shaded part of Figure 2)—which is inscribed within the circle? What is the ratio of the area of the 20 cm x 20 cm square to the area of the 10 cm x 10 cm square in the corner? What is the ratio of the area of the square-within-a square to the area of the 10 cm x 10 cm square in the corner? Do we know the exact ratio of the area of the circle to the area of the 10 cm x 10 cm square in the corner? Is it less than 4 to 1 (the ratio of the area of the 20 cm x 20 cm square to the area of the 10 cm x 10 cm square in the corner)? Is it greater than 2 to 1 (the ratio of the area of the square-within-a square to the area of the 10 cm x 10 cm square in the corner? What is the radius of the circle? What is the area of the radius squared? How does the area of the radius squared compare to the shaded area in Figure 1? Estimate: what is the ratio of the area of the circle to the area of the radius squared? The last problem of the week established that π is less than 4 and greater than 3 by looking at the ratios of the perimeter and width of a square, and circumference and diameter of a circle. This week we consider the area and radius of a circle. A comparison of two amounts is called a ratio. The ratio of the area of a circle to its radius squared is called π (pi) and it can be expressed as a quotient . Again this explanation can sound like Greek to many students – who also need to memorize and apply, pi ≈ 3.14. Like last week, we offer a problem to guide students (with simple geometry and good questions) to reason for themselves why pi must be less than 4 and in this case more than 2. Imagine that you had never been told that π ≈ 3.14. Use the squares and circles below to prove that the value of π must be less than 4 and greater than 2. For this exercise, all corners that look square are square. The solution will be posted next week. If you’re new to our blog, take a look at our earlier post, Why Guided Solutions for the Problems of the Week?. Here’s the solution for last week’s problem. Share other approaches. 1. Look at the square on the upper left. How wide is it across the middle? How wide is it across the top? How wide is it across the bottom? What is the length of the left side? What is the length of the right side? What is the perimeter (the distance around) of the square? 2. A comparison of two amounts is called a ratio. Tell this ratio: the perimeter of the square compared to its width. Write the ratio so that it looks like a fraction. Now reduce the fraction. What is the reduced ratio? 3. What is the width (diameter) of the circle on the upper right? Is it wider than the square that it is in? Is it wider than the square on the upper left? 4. Trace your finger around the circumference of the circle. Trace your finger around the perimeter of the square that contains the circle. Which distance is longer— the circumference of the circle, or the perimeter of the square? If you are not sure, think about walking around a corner on a sidewalk: if you are in a hurry, would you go straight and then turn right, or would you “cut the corner” by leaving the sidewalk and taking a curving path? 5. Think about the ratio of perimeter of the square to its width: the width times _____ (what number) = the perimeter? Think about the ratio of circumference of the circle to its width: the diameter times _____ (what number) = the circumference? Do we know? If you multiplied the width of the square times 4, would you get its perimeter? If you multiplied the diameter of the circle times 4, would you get its circumference? Or would you have multiply by some number smaller than 4? 6. Look at the hexagon on the middle left. How many equilateral triangles does it contain? What exactly is an equilateral triangle? How many sides does it have? Are all the sides of equal length? The hexagon is 7 cm wide. What is half of that distance? How wide is the base of the upper left triangle? How wide is the base of the upper right triangle? Is every side of every triangle that same length? What is the perimeter (the distance around) of the hexagon? 7. A ratio is a comparison of two amounts. Tell this ratio: the perimeter of the hexagon compared to its width. Write the ratio so that it looks like a fraction. Now reduce the fraction. What is the reduced ratio? 8. What is the width (diameter) of the circle on the middle right? Is it wider than the hexagon that is in it? Is it wider than the hexagon on the middle left? 9. Trace your finger around the perimeter of the hexagon contained in the circle. Trace your finger around the circumference of the circle. Which distance is longer—the circumference of the circle, or the perimeter of the hexagon? 10. Think about the ratio of perimeter of the hexagon to its width: the width times _____ (what number) = the perimeter? Think about the ratio of circumference of the circle to its width: the diameter times _____ (what number) = the circumference? Do we know? If you multiplied the width of the hexagon times 3, would you get its perimeter? If you multiplied the diameter of the circle times 3, would you get its circumference? Or would you have multiply by some number larger than 3? 11. Look at the figure on the bottom: a square with a circle inside it, and a hexagon inside the circle. Which is longer, the perimeter of the square, or the circumference of the circle? Which is longer, the perimeter of the hexagon, or the circumference of the circle? What is the ratio of the perimeter of the square, compared to its width? What is the ratio of the perimeter of the hexagon, compared to its width? What is the ratio of the circumference of the circle, compared to its diameter? Is it more than ? Is it less than ? Is it more than ? Is it less than ? We looked at ongoing or formative assessment in a math lesson in several posts and thought it would be helpful to use this post to organize them sequentially. So here they are. This collection of posts is similar to the one in A Model for Using Guided Discovery in a Math Lesson since ongoing assessment is fundamental to an effective lesson using guided discovery. The initial posts differ owing to the assessment or guided discovery focus of the collection. Click on the title and you’re off to the post. Since this post is part of a series, it may be helpful to read over A Model for Ongoing (Formative) Assessment – To Sit Beside and Observe #3 and Beginning a Lesson Using Guided Discovery to put it in context. You may also want to look over the podcast posted earlier on the Partner or Folding Pages to see a model of the content of this post. Earlier this month, we posted an outline approach to integrating assessment into a math lesson. Teacher and student ongoing assessment run throughout that initial step. Equally important, doing something about what is observed, with every student, is also integrated into that step. This post takes up the second step in the guided approach – working with a folding or partner page of problems. This engages students in quickly reconstructing and re-experiencing the work they did on the graphic manipulative. Both the graphic and partner pages are deceptively simple looking, while being highly flexible and engaging tools for building understanding and fluency together – in a way that can be directly observed. On the left is an image of a negative number partner page with the problems at one end and the answer key facing the opposite direction at the other end. (Our March 2 post has an image of a Soccer Teams partner page.) The same teaching approach laid out in the post on Guided Discovery should be used here – 1. use short phrases, 2. begin with an action verb, 3. model your directions as needed, and 4. look around to make sure everyone is on track. There is no point in having students construct and build visual memories of a wrong procedure or amount! These steps for delivering a lesson with the partner pages follow on the approach with the graphic pages. While not prescriptive, they do help keep students actively engaged in the work. 1a. “Fold the partner page in half and set it down on top of the graphic page.” The partner page takes the place of the blank paper described in the earlier post. 1b. 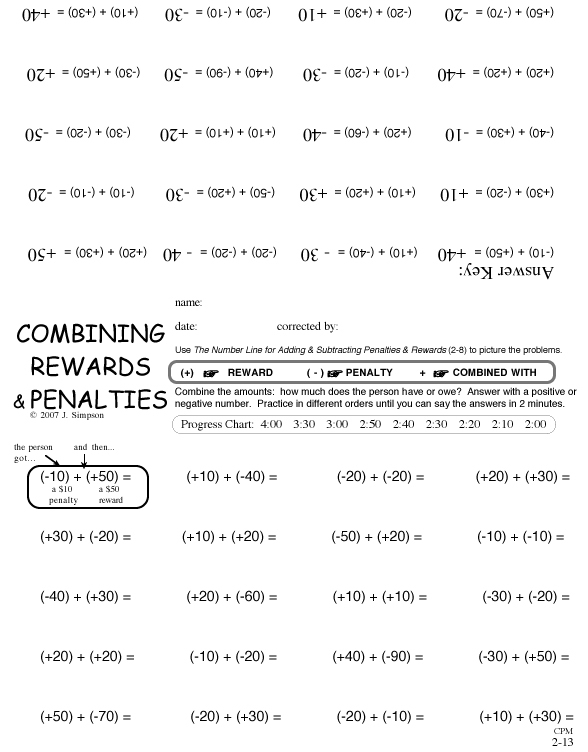 “Read the first problem on the partner page and move it to show that many…” teams, weeks, squares or roots, dollar bills, tickets, shirts, gallons, fractions of a cake, cheese slices, negative temperatures, “quadratic hearts”, or whatever graphic starts the lesson. 3. Respond to correct answers with a simple “good” or “correct.” Respond to every correct as well as incorrect answer. By doing this, there is no question as to whether the answer is correct or not. For an incorrect action or response, never give the answer. Instead, guide students to correct themselves with: “Try again” or “Show me on the chart how you got that answer.” As they reconstruct and rethink their solution, many will see for themselves what they did wrong and how to do it right. A few may require further guiding questions. Do the next problem or two as a class as needed. Then ask the class to work the rest of the problems like that individually. Ask them to read the problem; move their paper; and say the answer in a quiet voice. So that students won’t copy each other, have some work the problems going across the page; some going down (from top to bottom); and so on. Circulate around the room checking on their work responding to correct and incorrect answers. 4. Ask for a volunteer to do the first row of problems for the class. Remind them that it is not cheating to use the graphic page. Ask for others to do the next rows. Have the rest of the class follow along with the answer key to make sure these students are answering each problem correctly. 5. Ask for two volunteers to model working in partners, one doing the problems, the other checking the accuracy with the answer key. The partner checking the answers follows the model in step #3, never giving answers and saying “good” for every correct answer. And the partner simply says “try again” if the answer is incorrect. They have the graphic page to refresh their understanding of the procedure and the basic facts. The rest of the class follows to make sure these two are doing it correctly. 6. Now have everyone work in partners following the model in step #5. Summary: The partner pages build understanding and fluency together – in a way that can be directly observed. They involve cooperative learning with individual accountability, students receive immediate and ongoing feedback (but no answers), so they engage teacher, peer, and student in student self-correction. Going in different directions on the partner pages enables non-rote repetition. Like music students, math students benefit from going over a familiar exercise more than once. Getting better at what they are starting to get good at builds confidence along with competence. At this point, students have achieved the first two levels of success: 1. they understand what they are doing, and can accurately solve problems slowly, with the aid of the graphic page; 2. using a partner page, they connect manipulation with computation and gradually wean themselves from the graphic page, accurately solving problems with greater fluency. The next level, developing independent speed, accuracy, and understanding, using the progress chart, will be addressed in an upcoming post. 1. by good materials we mean those that, by their very design, allow for ongoing observation of student performance. The materials need to be flexible enough to help discover uncertainties in the current lesson while uncovering prior skill gaps. And they need to allow the teacher to address what is observed. 2. by good teaching, we mean putting and keeping students in the active role so they can be observed. If the teacher is in that active role defining, explaining, and modeling the lesson students are going to do, then precious observation time is lost. No good instruction is missed by putting and keeping students in the active role. Flexibility, as describe in point #1, also on the part of the teacher is essential to tap the potential in the materials and the students. The next post will lay out in more detail the next step in our earlier outline on integrating assessment into a math lesson – using the partner or folding pages.